Stained concrete floors are the smart choice for a unique, low maintenance flooring. 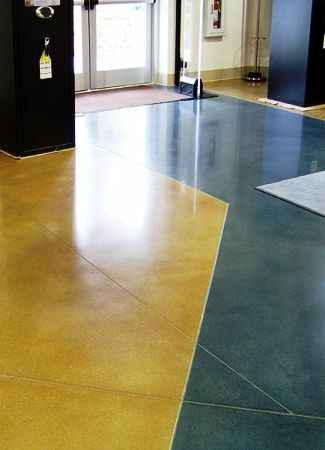 We can transform new or existing concrete into the floor of your dreams. Call 770-971-2778 to learn more. There are non-reactive water-based, and reactive acid stains which can be used indoors and outdoors. Nonreactive water based stains are the easiest to apply. These stains contain pigment particles that are absorbed by the concrete. Water based acrylic stains offer a very wide range of color options, and have a softer luster unless a clear glossy sealant is applied as a top coat. Floor designs requiring solid colors or patterns are usually done with water based stains. Highly detailed and intricate floor designs, including logos, are done using stencils. Reactive acid stains, versus water based stains, require slightly more labor to install. Acid stains are the most permanent and durable way to stain concrete. The stain contains metallic salts which react with the lime in the concrete which chemically bonds the color. After the stain has been applied, the floor needs a wash down and sealer applied. The finished product has a marble-like effect with a crisp translucent appearance which will not chip or peel. For most types of industrial concrete floors the preferred options are either use a simple stain or apply a specialty paint coating. The specialty paint coatings are typically urethane or epoxy products designed for high traffic applications where there is a need to make the surface impervious to liquid spills. Safety and directional floor markings are usually paint, specially designed pavement marking tape, or thermoplastic products. Most safety and directional markings are done by pavement marking and striping companies, and not by concrete finishers.